Pantera are more than just one of the great metal bands of the 1990s - they’re one of the great metal bands from any era. Formed in the early 80s by brothers ‘Dimebag’ Darrell and Vinnie Paul Abbott, the Texans took the intensity of thrash metal and gave it the kind of locked-in groove that other bands could only dream of, making a string of albums between 1990 and 2000 that not only raised the bar on what metal could do but also helped keep the genre afloat as it was assailed by grunge, pop-punk and various other passing trends during that turbulent decade. It helped that they had not one but two MVPs. Dimebag Darrell was a modern guitar hero, a man who could marry the riffs of Metallica to the pyrotechnic musical showboating of Eddie Van Halen. And Phil Anselmo was an entirely new kind of frontman – a coiled ball of fury who wasn’t afraid to bare his soul in service of the music. 1990’s groove metal landmark Cowboys From Hell was their fourth album, but that was the real starting point for Pantera as we know them. 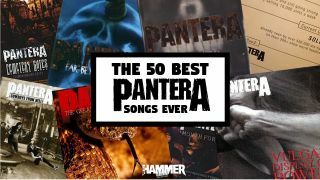 Over the next decade, the albums they put out - 1992’s Vulgar Display Of Power, 1994’s Far Beyond Driven, 1996’s The Great Southern Trendkill and 2000’s Reinventing The Steel – managed to pull off the astonishing feat of turning Pantera into one of the biggest metal bands around while actually increasing in power and intensity as time went on. Almost inevitably, it couldn’t last. Anselmo’s substance issues drove a wedge between him and the Abbott brothers, and Pantera flamed out soon after Reinventing The Steel. Tragedy struck in December 2004, when Dimebag was shot and killed onstage by a crazed gunman during a show by his new band Damageplan. Bitter acrimony from Vinnie Paul towards Anslemo meant that a reunion was always unlikely. But any hopes were completely dashed by the drummer’s sudden death in 2018. The final original song on Far Beyond Driven, the album that sent Pantera straight to the top of the US charts, Throes Of Rejection is defiantly uncommercial and pointedly ugly. ‘If there is a god, then it’s punishing me constantly’, raged Phil Anselmo, all hell breaking loose around him. Tuned down to G (which in layman’s terms means VERY HEAVY) and exhibiting a clear affiliation with the death metal scene, The Great Southern Trendkill’s closing track was no happy ending: ‘Exterminate, it’s all fake!’ roars Phil over yet more pulverising riffs. Neither a four-year wait nor the challenges of a new millennium could stop Pantera from sounding harder, bolder or more effortlessly imperious than they did on this scything opener from their final studio album, Reinventing The Steel. ‘Hellbound, in Fort Worth, Texas’ – yeehaw! The savage honesty of Phil’s lyrics has never been more apparent than on this gruelling cry of vengeance against his abusive father, from Far Beyond Driven. ‘I’m shoving my life right down your throat!’ he screams, as wickedly wrong-sounding riffs fester and snarl. Bloody hell. It may be a bit short on ‘woke’ points, but Far Beyond Driven’s snarled diatribe from woozy Philip Anselmo oozes the kind of skin-prickling malevolence that it’s impossible to fake. Throw in one of the Abbott Brothers’ wonkiest grooves and it’s a master-class in brutish bad juju. Despite their ubiquity today, it’s easy to forget exactly how revolutionary Dimebag’s riffs seemed when Cowboys From Hell was first released. Medicine Man took that sacred Van Halen strut and completely reconfigured it for a grittier, more brutal time. One of the less wilfully unhinged moments on The Great Southern Trendkill, Living Through Me combines punchy Vulgar… vibes with Pantera’s still-blazing love of extremity, resulting in a whisky-guzzling Southern metal assault that swings like a buffalo’s ballbag. The final track on Pantera’s last album, Reinventing The Steel. A grand and belligerent way for Pantera to bow out, this brooding paean to rising from the ashes now seems unbearably poignant: ‘When I die, I cast a shadow / And I’ll rise, I cast a shadow.’ For all their fire and fury, this band had the souls of poets, too. Heavy on Sabbath vibes but resolutely nasty with it, this The Great Southern Trendkill track’s sustained attack on nefarious forces in underground subculture is a bullish blur of gruesome imagery (“Ringworm, crabs and lice!”). “Give it five years,” Anselmo spits, “You’ll retire your piercings...” Miaow. Another early Cowboys From Hell-era Pantera tune that owes an obvious debt to Van Halen, Shattered takes the snake-hipped clatter of the latter’s Hot For Teacher and turns it into monstrous futuristic thrash, replete with falsetto shrieks from Anselmo.